(Bloomberg) -- The death of Hanjin Group Chairman Cho Yang-ho this week threatens to weaken his family’s grip on an aviation-to-logistics empire built over two generations. While the family is yet to disclose it, Cho’s eldest son Walter -- president of the group’s Korean Air Lines Co. and its parent -- is seen by analysts as his natural heir. But South Korea’s inheritance tax laws may require Walter to pay more than half of the value of the deceased Cho’s 17.8 percent in Hanjin Kal Corp., the holding company. Selling a part of that stake, worth about $278 million based on Tuesday’s prices, in order to pay the levy would see the Cho family’s control diluted. 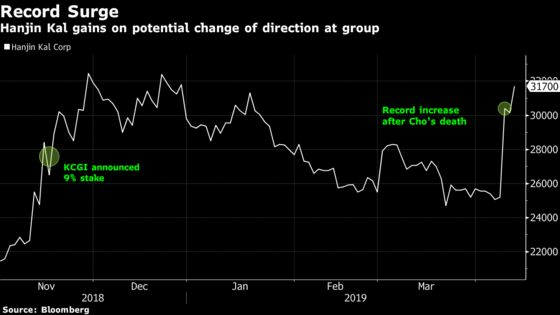 “Walter Cho is likely to inherit the chairman’s stake which is more than 17 percent,” said Lee Sang-heon, a corporate governance analyst at Hi Investment & Securities in Seoul. “The problem is, the death tax exceeds more than 50 percent in Korea and the chairman’s stake inherited by Walter could shrink." This challenge comes as the younger Cho, 43, prepares to take over the running of a conglomerate that has been at the center of controversy in recent years. While his succession to the chairman’s position hasn’t been announced, precedence at the group favors Walter Cho, because the oldest son of the main family has held that role for two generations. He also has the option of mortgaging assets to make the tax payment, potentially leaving the stake intact, Lee said. 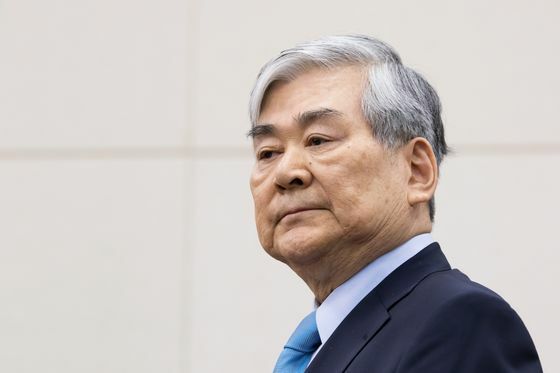 About two weeks before his death, Cho Yang-ho was ousted from Korean Air’s board amid charges of embezzlement, while Walter’s two sisters were previously removed from managerial positions for abuse of power. Heather Cho gained notoriety -- and spent five months in jail -- after the “nut rage” incident that made headlines around the world, where she forced a Korean Air plane to return to the gate in New York because she was angry over the way she’d been served macadamia nuts. Her conviction was overturned eventually by the country’s Supreme Court, but not before she was ousted as the carrier’s vice president for cabin service and catering. Emily Cho, the other sister, lost her post as senior vice president after she threw water in the face of an advertising agency worker during a business meeting. These incidents, followed by the charges against their father -- who was accused of embezzling fees meant for Korean Air from maintenance and duty-free operations in the five years through 2018 -- have emboldened activist investors to agitate for reform at the 73-year-old conglomerate, which also encompasses budget carrier Jin Air Co. and Hanjin Transportation Co. Hanjin Shipping Co., once South Korea’s biggest container line, collapsed in 2016 because of overcapacity in the industry, dealing another blow to the group. Read more about embezzlement case against the Korean Air patriarch. Korea Pension Service, which voted to remove Cho Yang-ho from Korean Air’s board last month, owns about 6.7 percent of Hanjin Kal, while the Korea Corporate Governance Improvement fund has 13.47 percent. The Cho family and its close allies own about 28.95 percent, with the siblings owning about 2.3 percent each. Inheritance taxes will need to be paid on the 17.8 percent stake held by the father. South Korea’s biggest family run conglomerates, known as “chaebol,” have been targeted by activist investors in recent years for their comparatively weak returns and lack of shareholder transparency. Samsung Group to the Hyundai Motor Group have been in the cross-hairs, and the National Pension Service adopted a stewardship code to take more active role as a shareholder in South Korean companies. Proposed rule changes that would make it harder for founding families to exert control have been stuck in South Korea’s National Assembly since November 2018. 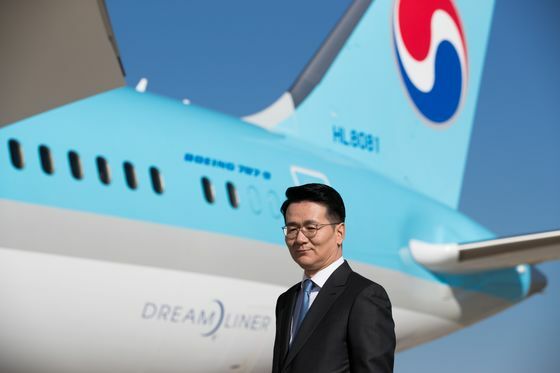 Representatives for Korean Air and Hanjin declined to comment on who will succeed the older Cho as chairman of the group, or how the tax levies will be paid. At 50 percent, South Korea’s top inheritance tax rate is among the highest in the developed world, with an extra 20 percent tax levied when passing down shares owned by the largest investor. The Chos aren’t the first Korean tycoon family to be hit with a hefty tax bill on the death of their patriarch. Koo Kwang-mo, the current chairman of LG Group -- one of South Korea’s largest conglomerates -- faced an inheritance tax bill of more than $630 million when his father died in May, according to Bloomberg calculations. Hanjin Kal shares jumped as much as 8.1 percent Wednesday, adding to a record 21 percent surge on April 8 following the news Cho Yang-ho died at age 70 in Los Angeles after receiving treatment for a lung ailment. Investors speculated his death may prompt the dismissal of the embezzlement case, and a potential change of direction at the conglomerate. If he succeeds to the top job, Walter Cho may look to replace family members and allies holding positions of power at Hanjin with professional executives, along with other shareholder-friendly steps, said Park Ju-gun, president at corporate research firm CEOScore.